This 21-Gun Salute Flag Display Case solid Oak or Walnut case has a triangular flag case centered in the frame. 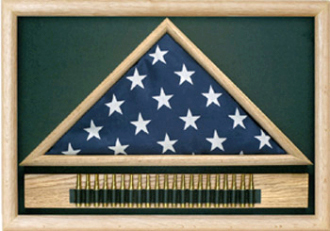 This 21-Gun Salute Flag Display Case solid Oak or Walnut case has a triangular flag case centered in the frame. The 21-Gun Salute Flag Display Case accommodates a 5' x 9 1/2' casket flag. The cartridge belt will hold up to 21 blank cartridges. Cartridges not included. The outside dimensions of the 21-Gun Salute Flag Display Case is 26" x 18" x 3". Dimensions: 26" x 18" x 3". 16 1/2" x 23 1/4" interior triangle for 5'x9.5' Flag.